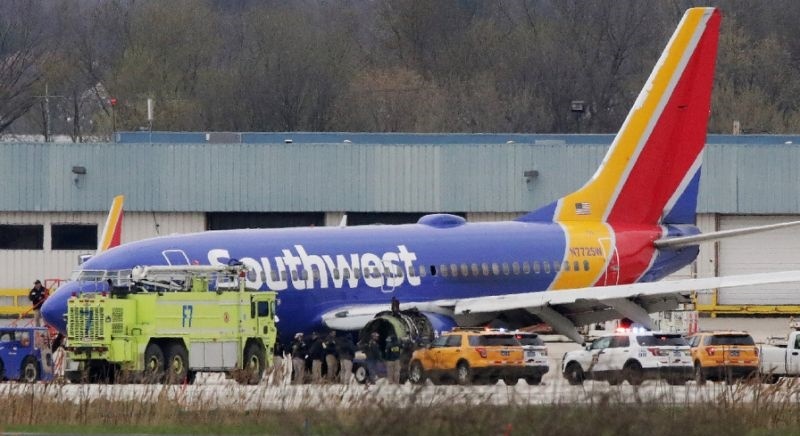 UNITED STATES: Catastrophic engine failure on a Southwest Airlines flight from New York to Dallas killed one person and forced an emergency landing yesterday (Apr 17), the first fatal incident in US commercial aviation for nearly a decade. The Boeing 737-700 took off without incident but minutes into the flight, passengers heard an explosion in the left engine, which sent shrapnel flying through the window, shattering the glass and leading oxygen masks to drop, witnesses said. US media said seven people were slightly injured. The identity of the dead person was not immediately disclosed. Southwest Airlines said flight 1380 had been en route from New York’s LaGuardia domestic airport to Dallas Love Field with 144 passengers and five crew members onboard. It landed at Philadelphia International Airport at 11:20 am (9:20pm Thai time) after the crew reported damage to one of the engines, the fuselage and at least one window, the Federal Aviation Administration said. “The entire Southwest Airlines family is devastated and extends its deepest, heartfelt sympathy to the customers, employees, family members, and loved ones affected by this tragic event,” the company said in a statement. NBC News released a recording of what it identified as communications between air traffic control in Philadelphia and the pilot, giving dramatic insight into what witnesses called a terrifying flight. “Something is wrong with our plane! It appears we are going down!” wrote passenger Marty Martinez on a Facebook live-stream that showed him looking panicked and breathing through an oxygen mask. Shrapnel blew out a window in row 17, injuring the woman and leading to the immediate deployment of the oxygen masks. The woman was later stretchered off the plane, he said. “There’s blood everywhere,” Martinez told CBS News, recounting his terrifying experience, after his live stream with the help of on board Wi-Fi. “All of a sudden we heard an explosion,” he told CBS. “There was a boom and within five seconds the oxygen masks dropped. “It just felt like a free fall,” he said. “It was the scariest experience.” The woman was hit by flying shrapnel, causing her to pass out and bleed, Martinez told CBS. It was the first fatal incident in US commercial aviation since the crash of Colgan Air Flight 3407 in February 2009, a Bombardier Dash-8 on a scheduled flight from Newark, New Jersey to Buffalo, New York. Fifty people were killed. Aviation experts drew comparisons on US television to another engine failure on a Southwest Airlines 737 flight from New Orleans to Orlando in 2016, which precipitated an emergency landing in Pensacola, Florida. “We want to look at this particular event and see what the factors are related to this. Maybe they’re related to the previous event or maybe not. But we need to understand what’s going on here,” said the NTSB chairman.